Hello again stamping friend! I want to share another look at Heartfelt Blooms; the stamp set that you can earn for FREE with a qualifying purchase during Sale-A-Bration. Sale-A-Bration starts on January 3rd, and runs until March 31st. 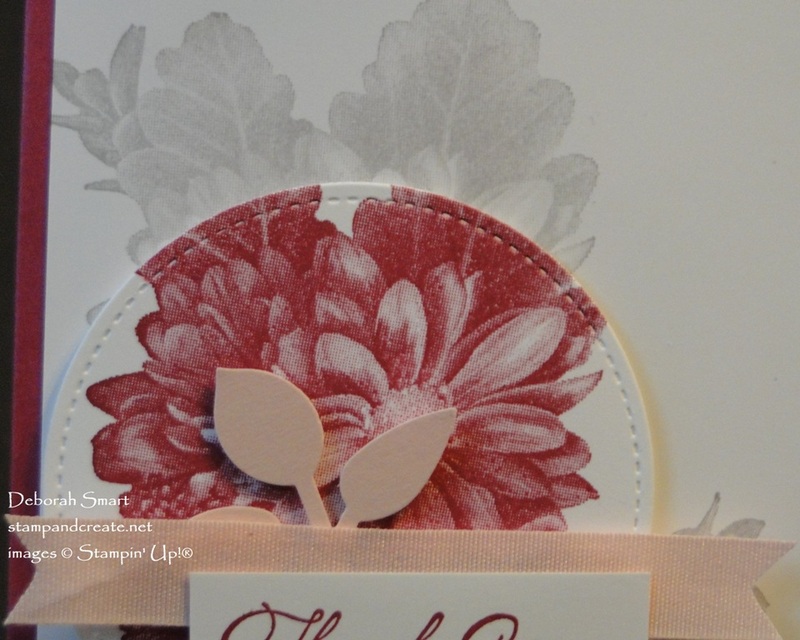 The Heartfelt Blooms set is made with a new technique; Stampin’ Up! is calling it ‘Distinktive’ (see what they did there? INK?!) This new type of stamp lays down the ink at different opacities, which gives the finished image more depth. It’s like 2 or 3 step stamping, without the extra steps! In this closeup, you can see how the stamp creates it’s own shadowing and detail – what we normally have to do with multiple stamps. Since I still had the colours out that I used on THIS CARD, I played with them again! On a 4″ x 5 1/4″ panel of Whisper White cardstock, stamp the full flower image in Basic Gray ink. Next, stamp the image again on another piece of White, this time in Berry Burst ink. Use the Big Shot and Stitched Shapes Framelits to die cut the flower with a circle. Use the Leaf Punch (in the Holiday catalogue) and punch out 2 sets of leaves, from Powder Pink cardstock. 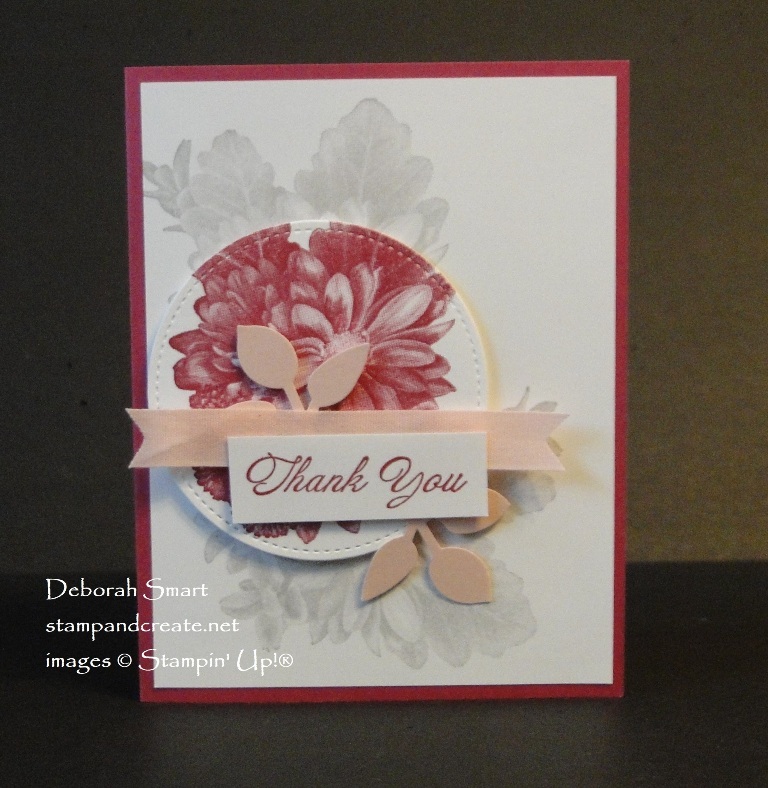 Stamp the sentiment from the Heartfelt Blooms set in Berry Burst ink onto a scrap of Whisper White. 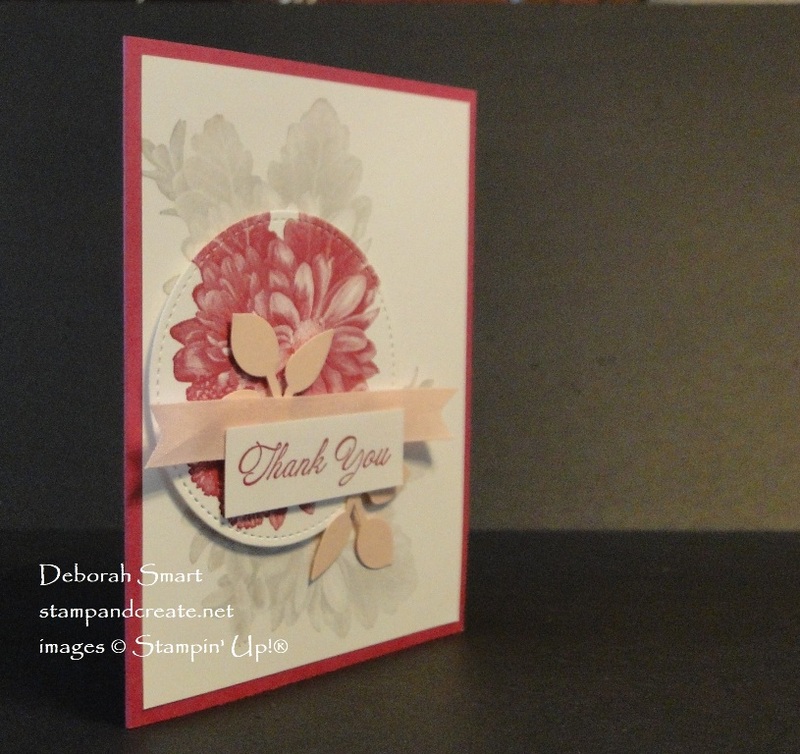 Attach the large white panel to a card base of Berry Burst cardstock, using Multipurpose Liquid Glue. Next, attach the die cut image on top of the stamped image, lining them up as best you can. Use Dimensionals to attach it. Add a length of 1/2″ Finely Woven Ribbon in Powder Pink under the sentiment with Tear & Tape, then add the punched leaves with Mini Glue Dots. Finally, attach the sentiment on top of the Berry Burst flower, with Dimensionals. This is a quick & easy card to pull together, but this stamp gives it a ‘wow’ factor. GET READY TO ORDER IN JANUARY! If you want to get this beautiful Heartfelt Blooms stamp set, you’ll need to place a qualifying order of $60 or more (before tax/shipping) during Sale-A-Bration! You can’t buy it – you can only get it for free! Your order can be for any product type, whether it’s from the new Occasions catalogue, the Annual catalogue, or the Clearance Rack. If you don’t already have a demonstrator in Canada, and would like to receive the Occasions and Sale-A-Bration catalogue, please email me at debsmart@shaw.ca with your information! To order any of the current products I’ve used, simply click on either the product images below, or my signature. My online store is open 24/7, so you can shop whenever it’s convenient to you! Next Next post: It’s A Sale-A-Bration Celebration! This set was not on my radar and, once again, I have to get it because of your amazing cards! Enabler!! Aww – you’re welcome, Susan! LOL! 🙂 Only fair, since you usually enable more than a few of my purchases throughout the year! What are friends for, right? !